Philosophy Kiss Me Tonight Moisturizing Lip Treatment. Philosophy is a staple skincare brand with a celebrity client list that reportedly includes the likes of Oprah. Philosophy products are available to purchase from RY online. 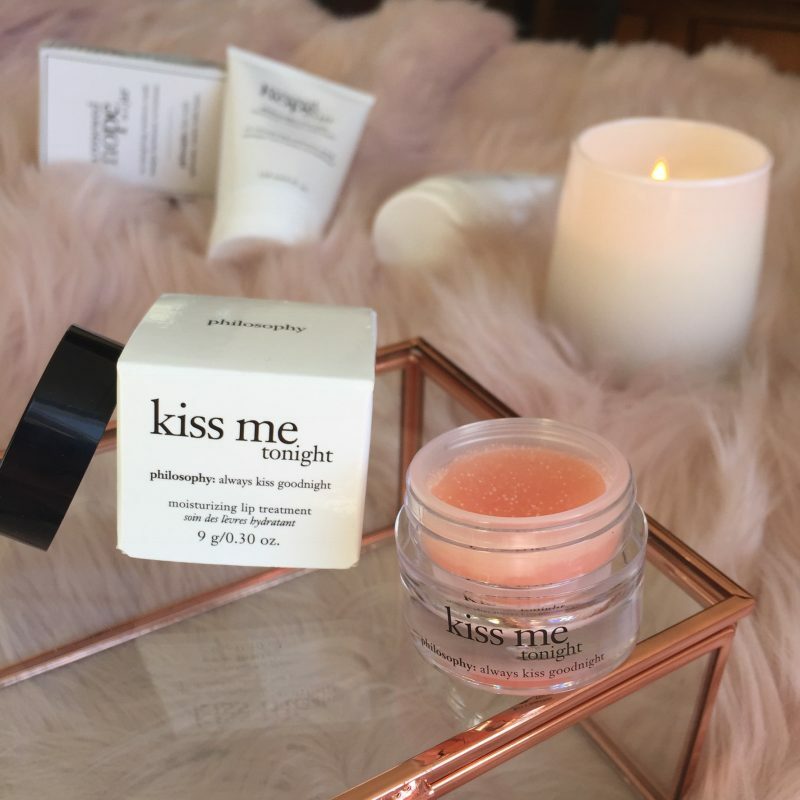 Philosophy Kiss Me Tonight Moisturizing Lip Treatment is an ultra creamy and moisturising lip balm that keeps lips soft and kissable. It’s naturally derived emollients nurture, soften and moisturise the lips instantly. Due to the current weather conditions my lips had recently become a bit dry and were starting to crack. This Philosophy Kiss Me Tonight lip treatment quickly fixed that! I found this product to be more effective and nourishing than other lip balms I currently have in my skin care collection. This balm is easy and soothing to apply and absorbs into lips straight away without leaving any greasy residue. My lips always feel hydrated and soft immediately after using it. It restores my lips to a healthy, rosy appearance. I like the secure jar packing of this product. 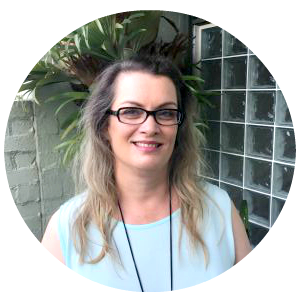 It is easy to throw into my handbag with no worries about the lid becoming dislodged. 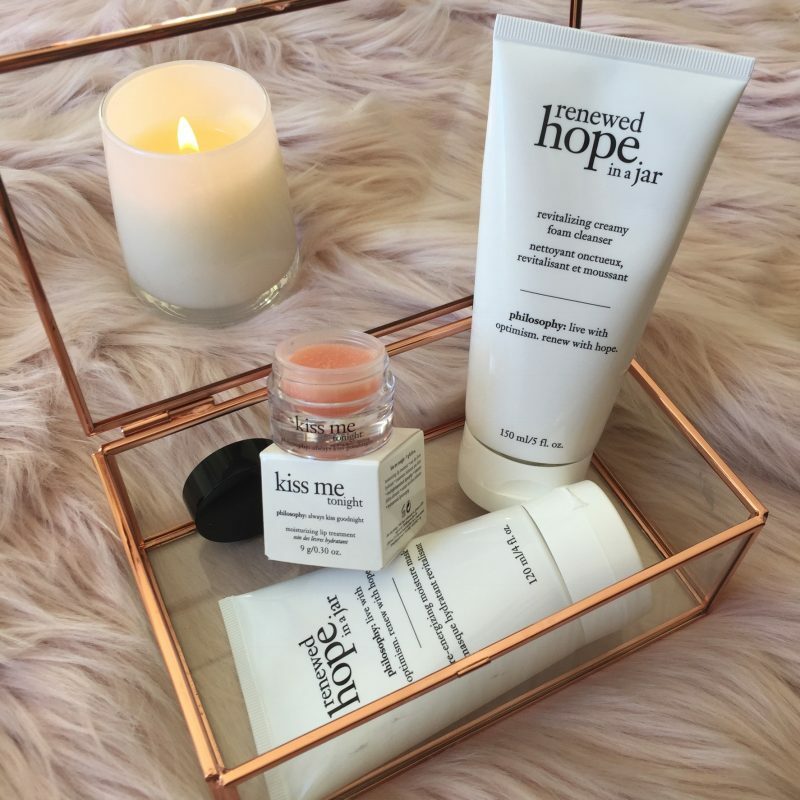 I highly recommend the Philosophy Kiss Me Tonight Lip Treatment to condition and soothe dry cracked lips. 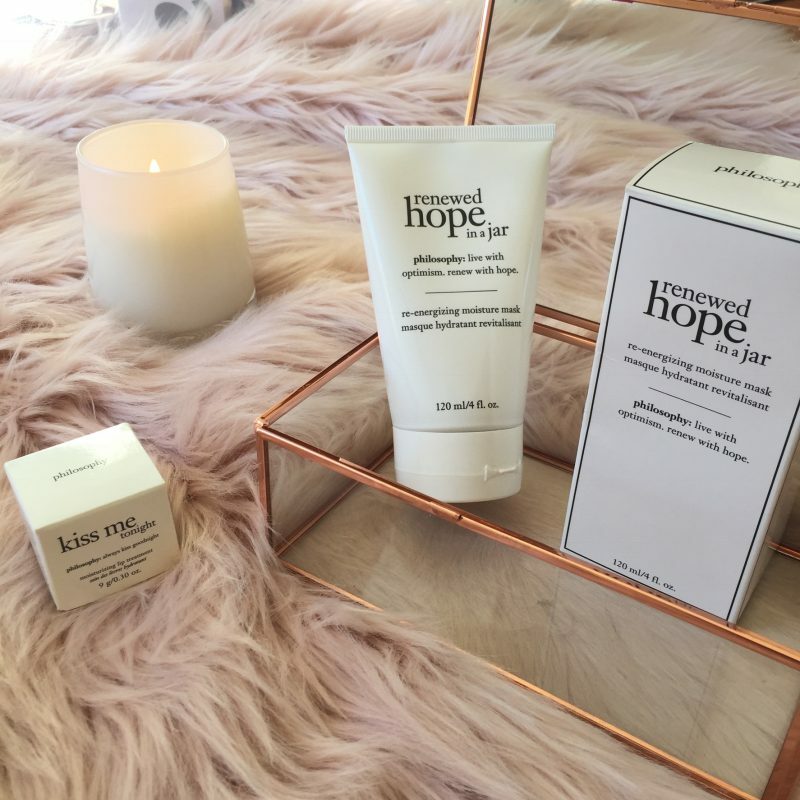 The Philosophy Renewed Hope In A Jar Revitalizing Creamy Foam Cleanser is amazing! It is different to other foam cleansers I have used in that it squeezes out of the tube as a thick white cream which you then add water to in the palm of your hand and work it into a foam before massaging it onto your face. It foams up beautifully and unlike other foam cleansers it feels luxe and hydrating on your face. It’s a gentle cleanser that removes makeup as well as oil, dirt and impurities. My skin felt refreshed, silky soft and smooth, with a healthy looking radiance after washing my face with this cleanser. You only need to use a small amount of this product per cleanse so one tube should last for several months. As a beauty blogger I receive a lot of products to trial not all of which I finish, let alone purchase after using the initial sample but this Philosophy Renewed Hope In A Jar Revitalizing Creamy Foam Cleanser has impressed me and is now a firm favourite of mine that I will definitely be purchasing after I finish this tube of it. The Philosophy Renewed Hope In A Jar Revitalizing Creamy Foam Cleanser is currently on sale at RY online. 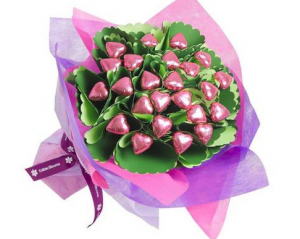 Click HERE to check out it’s current sale price. The Philosophy Renewed Hope In a Jar Re-Energizing Moisture Mask is a wonderfully velvety whipped formula with non-stop skin renewal technology which re-hydrates, re-texturizes and re-energizes skin with a cooling, instant burst of hydration. It’s the perfect product for my mature skin in this current weather! It’s quick and easy to use, you simply apply the mask to dry skin and leave on for 10 minutes before rinsing off. It’s recommended to use three times a week. I found this mask to give my skin the best boost of hydration! I also found it reduced my pores and some of my fine lines thanks to its included blend of alpha hydroxy acids (AHAs). This mask feels slightly tingly on the skin due to the AHAs but I didn’t find it at all irritating. It doesn’t set so it can easily be wiped off and rinsed after 10 minutes. In a self-assessment study of 38 women aged 25-40, 82% of women said their skin felt softer, smoother and re-energized after just one use of this masks. My findings are consistent with this study. 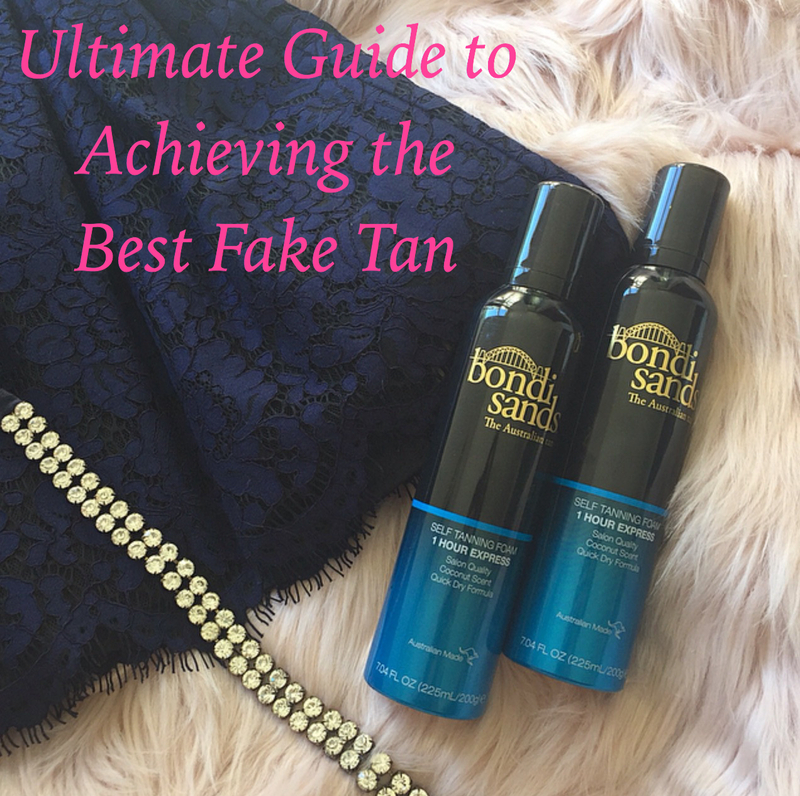 After using this mask my skin did feel softer, smoother, hydrated and yes, re-energized. I’ll happily continue using this mask as part of my current skin care routine. It’s the perfect mask for Sydney’s current weather conditions. Just be careful to use sunscreen in the week after using this product as AHAs may increase your skin’s sensitivity to the sun and increase the possibility of sunburn. 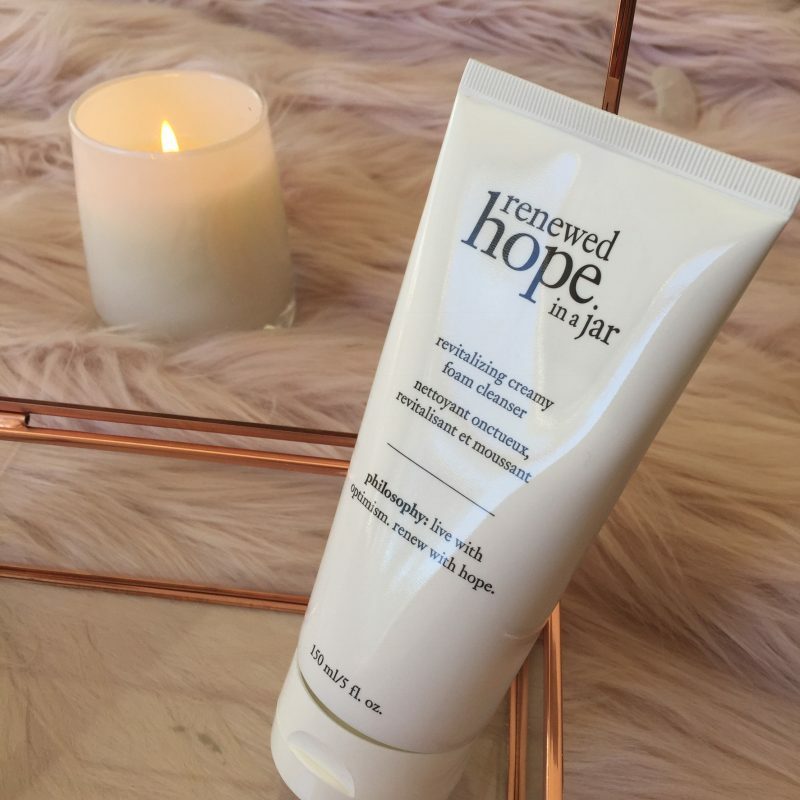 The Philosophy Renewed Hope In a Jar Re-Energizing Moisture Mask is available for purchase from RY. It is currently discounted. Click HERE to check out the current price. You may also be interested to read about gold infused skin care HERE or about Mavala Switzerland Skin Solutions HERE. Have you used any Philosophy products? THIS ARTICLE MAY CONTAIN COMPENSATED LINKS. THE ABOVE PRODUCTS WERE KINDLY GIFTED TO ME FOR EDITORIAL CONSIDERATION. ALL OPINIONS ARE MY OWN. PLEASE READ OUR DISCLAIMER FOR MORE INFO. I like the look of that lip balm, I’m a bit of a lip balm junkie! The name Philosophy sounds familiar but I don’t think I’ve seen the products before unless they’ve been rebranded or something. Oh I have been dying to use their Kiss Me Tonight! I LOVE philosophy’s skincare line. I’ve never bought a product of theirs that I didn’t like. I’ve never used the Philosophy range, but have always been tempted because of the names. It’s such an amazing marketing trick. What can I add to this other than the names on the jars! So cute. I must admit I do love a hydrating mask. Always makes me feel very feminine and like I am concentrating on self-care. I had not heard of this brand, will definitely check it out! Love the packaging – that lip balm looks lovely! These sound lovely, especially the lip balm. The mask and cleanser sound ahmaaaazing! I have used the moisturiser before and absolutely loved it! I’ve always wanted to try Philosophy skin care, mainly because of the packaging haha. Out of these three products I’m totally drawn into the mask! It sounds so lovely. The lip cream sounds really good. Off to check out prices. I didn’t realise the hope in a jar range had so many products! Adding them to my never ending list haha. I want to try the Kiss Me Tonight lip treatment. Sounds like such a lovely balm! It’s definitely worth buying. It’s my new favourite lip balm! I love the ‘Purity Made Simple Cleanser’ by philosophy, their products are amazing! Philosophy products are so gentle yet so effective! I need the item for the lips! My lips are always dry from walking in the wind! Philosophy’s Kiss Me Tonight Moisturizing Lip Treatment is the perfect remedy for dry lips from the wind.